Don Wycherley in Eoin Colfer's My Real Life. GALWAY THEATRE-goers are in for a treat next weekend at the Town Hall with two performances of the achingly funny and touching drama, My Real Life, written by Eoin Colfer and performed by Don Wycherley. 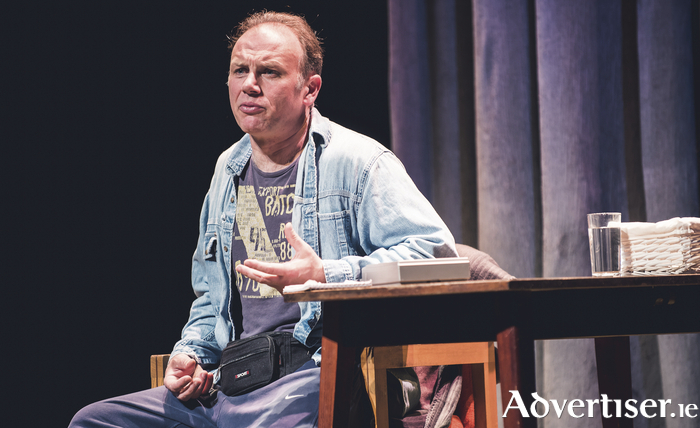 The play introduces us to Wexford man Noel, who has advanced MS and decides to end it all. While waiting for his overdose to take effect he records an increasingly rambling message for his best friend. Noel has apologies to make and messages to send. He has love in his heart and he wants to declare it even if it is already too late. Noel spends what is possibly the last hour of his life re-living the highs and lows of the past 40 years and, surprisingly perhaps, this is a play that will make you laugh, as well as make you cry. While Colfer is best known for his Artemis Fowl novels, My Real Life is not his first foray into theatre as he tells me over a Friday morning chat. “I started off in theatre actually," he says. "I had done a few plays in my twenties and I was very active in amateur dramatics. I stopped writing plays when I went overseas and began working in Saudi Arabia – there wasn’t much call for them over there! Then I began concentrating on books and because they took off it took me a long time to get back into plays. Then, in 2014, I dipped my toe in with a 15 minute version of My Real Life which Ben Barnes asked me to do for Wexford Arts Centre. Colfer expands on the character of Noel and the story that he tells in the play; “In the 15 minute version the character was based quite exclusively on a close friend of mine who has MS. What I wanted to put across in that first version was that he is still the same guy he always was, despite his condition, he’s still funny, still has a great personality. I talked to him about it at the time and showed him the script, I was very anxious that he didn’t feel I was using him as a hot topic or being patronising. A one-person show can be a tricky thing to get right, especially when it is over two acts, as Colfer readily acknowledges; “My biggest worry was that if you have a guy onstage on his own for this length of time after a while it’s very hard to avoid it just being a catalogue of yarns. We did a lot of editing and pruning with it. You just have to try and balance the laughs with the pathos, I remember Don saying ‘It’s grand in the first act to show everyone you’re funny but in the second act you have to hit them in the gut’ and that’s what we tried to do. "The first act is proving to be very funny and Don is such a great raconteur that he has the audience in stitches but then in the second act you have to get down to business. Noel is literally on a clock, he has 45 minutes to say what he needs to say. So everyone laughs in the first half and people have literally cried in the second, it really makes an impact. Books-wise, Colfer’s next release is worth keeping an eye out for. It’s a graphic novel, Illegal, created in collaboration with Andrew Donkin and illustrator Giovanni Rigano, which portrays the journey of two refugees journeying from Ghana to Europe. Aimed at young readers, it will by published by Hodder in October. “It’s a new phase of my career where I’m trying to deal with more serious topics but in a humorous way,” Colfer states. “You want to be responsible to those topics and the danger here is it’s a story about the tribulations of refugees from Africa being written by three middle aged, middle class, Europeans. So you have to walk that fine line between patronising someone and not being truthful.